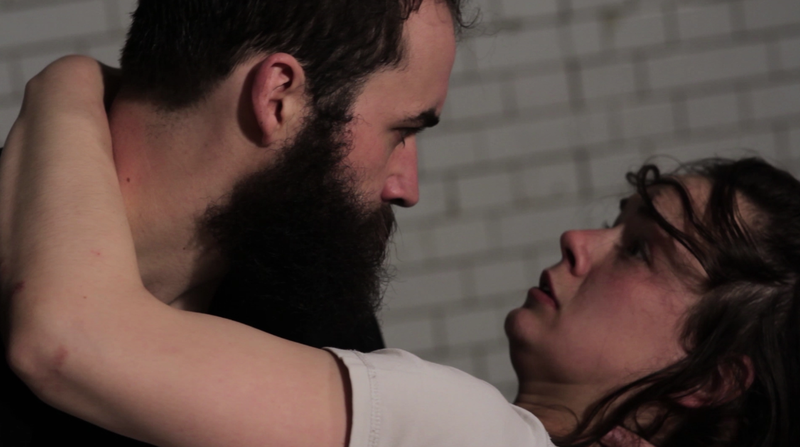 A Question of Consent is a troubling piece of devised theatre. Based upon one woman's true experience (to quote the press release) of being “groomed and raped on a daily basis for a month”, it seeks to explore the Stockholm Syndrome, in which the victim develops affectionate feelings (and in this instance, love) towards her aggressor. This is a tale of damaged people damaging each other further. Unfortunately, it is also a damaged work. Opening with the young woman leaving her boyfriend, we see her taking a room in the house of an elderly man. The old man’s intrusion into her space is immediate as he insists on sharing a welcome drink with her much against her will. It's chilling and scene-setting, but no more so than a corny horror movie. When we next see landlord and tenant together, he rapes her and it is clear that he has been habitually sharing her bed and taking an unhealthy interest in her dirty laundry, almost since she moved in. Whilst this may well be historically true, intelligent theatre demands some form of analysis or comment, rather than a prurient collection of intrusive snapshots. The work pans out in a similar vein, with scenes (some revolting) played out, chapter by chapter, with little by way of explanation or attempt at commentary. We are shown the graphic rapes, but see none of the grooming that the press release hinted at. Scratch this play's surface and it is little more than a collection of (sometimes) well-acted vignettes. There is no hint of an explanation for example of the victim’s back-story and in its present form the play’s arc, focussing upon a woman who is clearly an intelligent young student, defies credibility. At the end there's a Q&A session between audience and cast. There is no curtain call or applause, the discussion commencing the moment the drama ends with the audience having been previously advised that they may participate or leave as they choose. This is a lazy way of exploring a play's argument, leaving explanations and analyses to be bolted on as an optional extra. On my attendance, some of the comments from the audience were on-point whilst others were self-seeking and trite. Leaving mid-discussion is allowed but is inhibitive, particularly for someone shy and one fears for an audience member who may be troubled (or bored) by the play, yet lacks the courage to either speak-out or walk-out at its conclusion. The physical theatre is intense and amongst the company, Romanian actress Iulia Benze is the best of the bunch. There is the potential for an intelligent debate to be sparked by the issues raised in A Question Of Consent, but a great deal more work is needed. The play's disparate scenes require a skilled dramaturg to stitch them together, to allow its message, like its female subject, to be properly released.